Just because the stain doesn’t stand out, doesn’t mean it’s not there. Pet hair, dust mites and various other allergens could be quietly living a lavish life between the fibres of your upholstery. If that old sofa hasn’t been professionally cleaned in year or two, it’s time to seriously consider a thorough scrubbing. We are currently in the process of completed our full verification process for Melbourne upholstery cleaning companies. Crystal Clean stands by their business with a money-back guarantee and no-obligation, free quotes for all your sofa, lounge and furniture cleaning needs. Founded in 2007, this innovative company has quickly gained a reputation as one of the leading Sydney based upholstery cleaning companies. Full insured and reliable company. Proving both in-home and in-office upholstery cleaning services, Clean with Envy uses only the latest cleaning technologies to get the best possible outcome for the customer. Owning an array of certifications and a $10 million dollar public liability insurance policy, there’s no reason to feel nervous when hiring this company for a job. Free-estimates are also available so don’t hesitate to call up for a quick conversation and price quote. Smartly fashioned and centrally located, ASAP exclusively caters to Metropolitan Melbourne, leaving the suburbs to fend for themselves. ASAP frequently markets exclusively packaged deals for the urban dweller including one bedroom and two bedroom apartment specials. For upholstery they start each job with a basic dry-vacuuming before progressing to hot water extraction to get couches and lounges looking their freshest. Family owned and operated since 1986, Jumbuck Upholstery Cleaning Melbourne is full verified, and has won a number of awards. Not only will their fully trained technicians get the stains out of the most challenging fabrics, including leather, jacquard, velvet, and Haitian cotton, but they’ll provide a free, no-obligation, written estimate at the onset of every job. AllCarpets employs a team of specially trained technicians ready to treat just about any type of upholstery, including micro-suede, cotton and leather. Taking advantage of a variety of techniques and biodegradable cleaning agents, All-Carpets works to keep your upholstery and the environment stain-free. AllCarpets will provide free-quote with every job and only bills for the services rendered in the quote. Translation?—No hidden fees. Contrary to the competition, it’s actually difficult to think of a reason to not hire Clean With Envy for their lounge and sofa cleaning services. Not only do they guarantee the quality of their work, but they publish a running list of customer reviews and referrals on their website to let the world know just how good a job they do. The owner is also the chief operator which means each job gets the highest level of attention: there are no third-party contractors or disinterested employees. 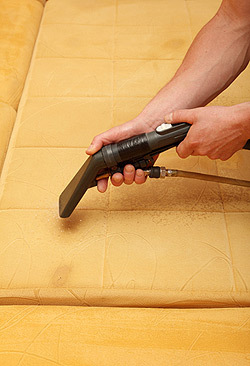 Upholstery isn’t limited to just spot cleaning. Clean With Envy also offers deodorisation and fabric protection services. Grooming fabrics where appropriate and assessment of final outcomes. Upholstery Cleaning Service: How does it work and what results can you expect? Relatively straightforward, upholstery cleaning doesn’t need to be thought of as a cumbersome process, particularly for those persons willing to invest the minimal time and effort to learn about local professional cleaners. Generally speaking, aim to have all upholstery cleaned at least once every 18 months—regardless of “noticeable” stains—to promote the longevity of lounges, sofas and all other upholstered items. For serious stains, the success of any professional cleaning effort depends on a number of variables including the chemical composition of the stain and the fibre of the material which has been stained. Most professional cleaners will offer a free-price quote based on the difficulty of the job and, assuming a hire, will proceed to thoroughly dry-vacuum the stained area, before moving on to a stain-removal treatment. Expect a basic stain removal treatment to consist of a low-pressure, hot water (steam) immersion, a “dry” chemical application or some combination thereof. Again, results are difficult to predict with 100% accuracy, but talk to the technician attending to your upholstery. Using their training and experience they should be able to provide a well-educated guess.